Italy is not only famous for its delicious cuisine, iconic dishes and excellent wines, but also for its aperitivo culture, and its amazing choice of digestivi (digestive drinks). Typical (alcoholic) Italian drinks include Italian liquors, liqueurs, vermouths, fortified wines, dessert wines and grappas. Some of them are consumed as aperitifs, some as digestives, rarely as both, and some are paired with specific dishes or used in cooking. Aperitivo: an apertivo is meant to whet the appetite, and therefore it’s usually dry or bitter and low in alcohol. An exception to this are the famous Italian cocktails, which in Italy are usually consumed as an aperitif, but can still be a little sweeter, depending on the mixture. They are still much less sweet than international cocktails. Martini, Cinzano, Campari and Aperol, are famous Italian brands of aperitifs that are also used as ingredients for pre-dinner cocktails. Etymologically the term is related the Latin word aperire ‘to open’. Apparently, Italians already knew what recent research has demonstrated, that when mouse gut cells are stimulated with bitter elements they trigger secretion of a hunger hormone. Most of the famous Italian aperitifs and pre-dinner cocktails are relatively bitter in taste (as compared to international standards). Indeed, bitter drinks challenge the liver, moderate hunger over the course of the meal and optimize digestion, resulting in a better management of blood sugar levels and fat storage. Sweet drinks and cocktails, on the contrary, tend to spike and dip appetite, they also decrease metabolic efficiency, prompting the body to store more fat. Vermut or Vermouth: is an aromatized wine, with an alcohol content between 15,5% and 22%, an prime ingredient of many cocktails, Note that the Italian term “vermut” is legally reserved to beverages with an alcohol content of at least 15,5%, and 18% for the dry ones. As most Martini varieties have an alcohol content of 14,4% the term “vermut” no longer appears on the bottles. 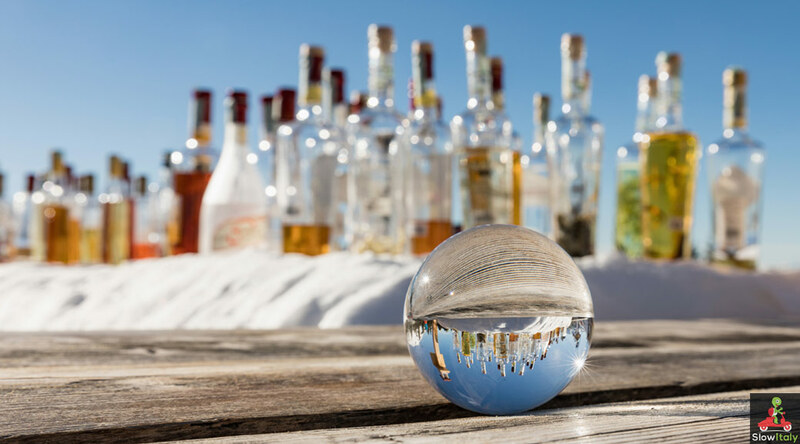 Digestivi: popular Italian digestifs are the grappa, amaro and amaretto, centerba, strega, genepi and sambuca. By definition a digestivo is a drink served at the end of a meal to aid digestion. A sheer variety of digestive beverages are available in Italy, ranging from liquors, such as grappa, to liqueurs, alcohols infused with herbs, or other aromas, such as amari. Note the difference between a liquor and a liqueur, which even in English are often confused. A liquor is an unsweetened distilled alcoholic beverage, such as grappa (or gin, tequila, for example). A liqueur is usually sweet and prepared by infusing neutral spirits with sugar, herbs, spices, or fruit and flavoring agents, such as limoncello, amaretto, nocino, etc. Amaro: is an aromatized liqueur, so the equivalent of a vermouth but with liqueur instead of wine. Most amari are bitter and sweet, sometimes syrupy, although there are also dry amari, such as the Amaro Averna, produced in Sicily. The production process usually consists of two phases: infusion, during which different aromas macerate in alcohol, blended with sugar syrup, and distillation. A special type are the amari centerbe each of which has a proprietary formula that generally includes various herbs, roots, leaves, barks, flowers and spices that are believed to have stomach-settling properties. They generally have an alcohol content between 27% and 42%. Not to be confused with amaretto, see below. 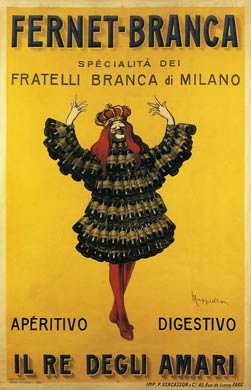 Alchermes: an intensely scarlet red-colored Italian liqueur that was very popular in Firenze at the time of the Medici. It is made of sugar, cinnamon, cardamom, cloves, maces, coriander, anise flowers, orange zest and vanilla, and other herbs. Its scarlet color is obtained by the addition of cochineals. The term derives from the word alquermes, from the arabic al-qirmiz, meaning ‘scarlet’. Amaretto: a generic name for a sweet Italian liqueur originally flavored from bitter almonds. The most famous one being the amaretto di Saronno. (see futher). Amaretto di Sassello is an Italian sweet liqueur from Sassello in the province of Savona, Liguria. It is made from a base of various aromas and caramel, which gives it its typical color. The name is a diminutive of the Italian amaro, meaning “bitter,” indicating the distinctive flavor. 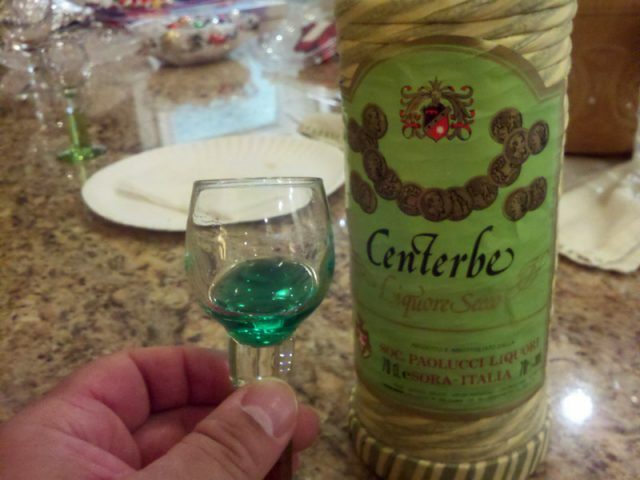 Centerbe or Centerba, translated as “one hundred herbs”, is a traditional Italian liqueur with a characteristic emerald green color made of digestive and medicinal herbs found on the Monte Morrone, Majella, Gran Sasso mountains, part of the Apennines. It is very common in Abruzzo, where it was originally known as cianterba. It is ususally drunk neat (undiluted), despite its 70% content of alcohol, or used to lace a coffee, milk or chocolate drink. Cinzano, which also originated in Turin, is a sweet or dry vermouth (bitterer than Martini). Disaronno is a brand of Italian liqueur is an infusion of apricot kernel essential oil flavored with seventeen selected herbs and fruits. It is based on an original, secret recipe dating back to the year 1525. Despite its characteristic bittersweet almond taste the product does not contain any almonds or other nuts. Its production remains in Saronno, but the product is sold worldwide. The product was previously known as “Amaretto di Saronno” (Amaretto from Saronno) before it was changed to the current name “Disaronno Originale”, for marketing reasons. Disaronno Amaretto is one of the few Italian drinks that is used both as an aperitif and digestif, stand-alone or as an ingredient in some cocktails, or, more commonly in coffee-based drinks. It is also a key ingredient in some Italian dessert recipes, such as tiramisù, chocolate mousse or fruitcakes. When consumed alone it can be served neat, on the rocks. Alternatively you can drizzle Disaronno over vanilla ice cream for a simple yet stunning dessert. Fernet is a type of amaro, aromatically flavored with over 40 herbs and spices, among which saffron. It is used as a digestivo for its digestion-enhancing properties. It is also used to make the famous “caffè corretto”, a coffee spiked with liqueur. It may be served neat or on the rocks. In recent years it has also been used as an ingredient for cocktails all over the world. Fragolino, similar to limoncello, but strawberry-flavored. Frangelico is a traditional hazelnut liqueur from Piedmont, made of local hazelnuts infused in a solution of alcohol and water, part of which is distilled and later added to the infusion. The solution is blended with natural extracts such as cocoa and vanilla. The drink is enjoyed neat, on the rocks, with coffee or in a wide variety of stylish cocktails. 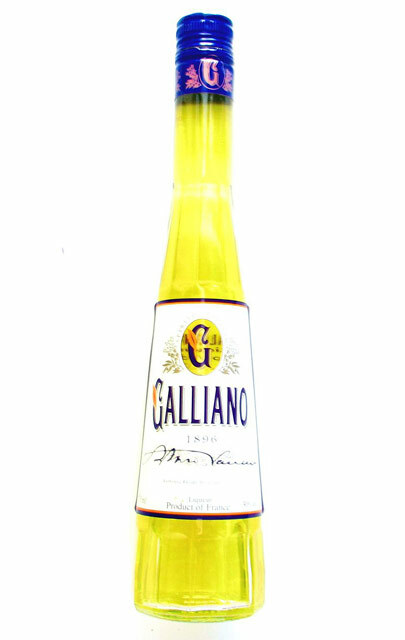 Galliano is a sweet, anise-flavored herbal liqueur created in 1896 by Arturo Vaccari, an Italian distiller of Livorno, Tuscany. The main ingredient of the liqueur is vanilla, which differentiates it from other anise-flavored liqueurs such as Sambuca. The liqueur also contains anise, of course, and licorice, with hints of peppermint, lavender, ginger, juniper, musk yarrow and cinnamon, with subtle citrus and woodsy herbal under notes. The production process is very complicated as it consists of seven infusions and six distillations. Grappa is a liquor made from fermented peels, seeds and stems of grapes. It has a high alcoholic percentage and is transparent as water. It can be found natural or with various flavors (pears, prunes, and herbs). 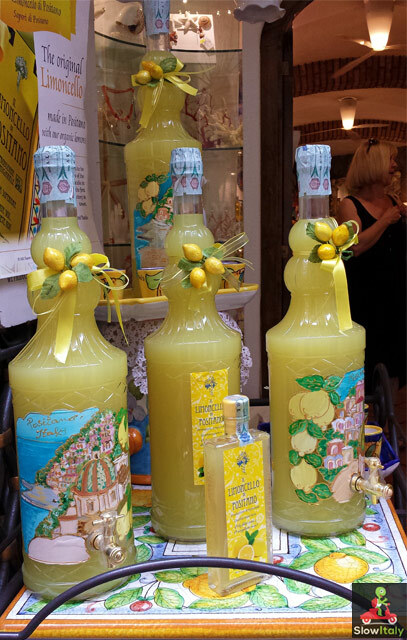 Limoncello is a strong lemon liqueur produced in Southern Italy, originally in the region around the Gulf of Naples. It is made from lemon zest, alcohol, water, and sugar. It is bright yellow in color, sweet and lemony, but not sour since it contains no lemon juice. It can turn out bitter if the lemon rinds were peeled to grossly. Limoncello is traditionally served chilled as an after dinner digestivo. The best limoncello is made with the lemons of Amalfi. 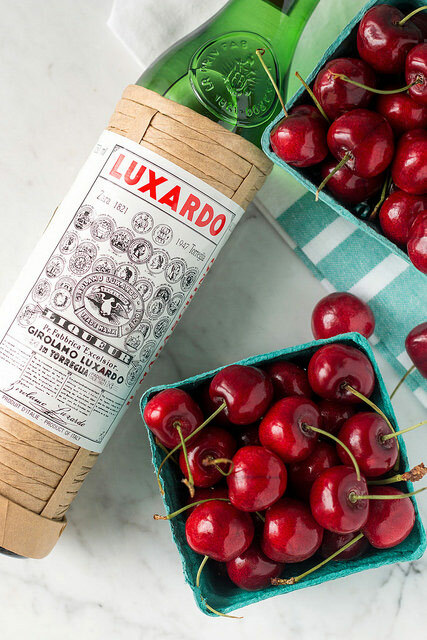 Maraschino, an Italian cherry liqueur produced according to an original recipe dating from 1821. The sweet distillate is produced from a special type of cherries known as Marasca, which gave the liqueur its name. The components are infused in larchwood, after which the product is distilled in small copper pot stills. A combination of sugar and water is added before bottling. The rounded taste is smooth, but sharp with a surprisingly persistent aroma despite the moderate alcohol content. Martini exists as white, red, rosato, extra dry and bitter “vermouth”, and is originally from Turin. There are many variations of martinis. The three most popular are dry, sweet and medium. For Martini cocktails, see Italian aperitivi and cocktails. 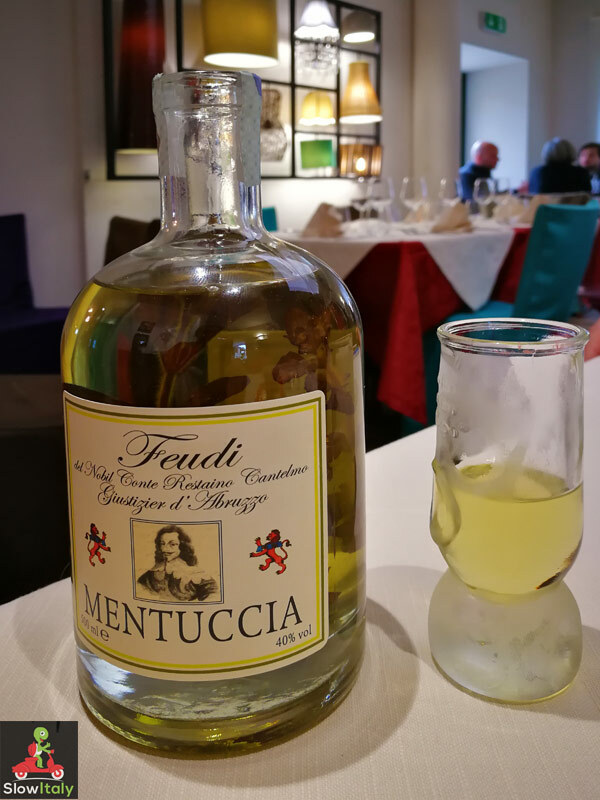 Mentuccia, a delicious mint liquor based on an infusion of mentuccia (Calamintha nepeta, known as lesser calamint) produced in Frosinone and consumed neat, in a chilled glass, or on the rocks. 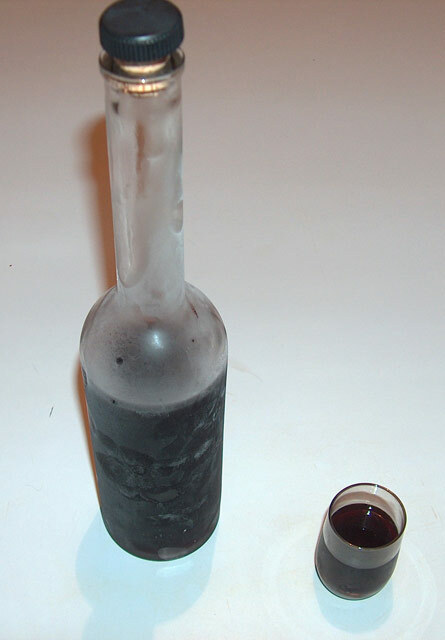 Mirto is a bitter Sardinian liqueur, obtained through the alcoholic maceration of the berries or or a mixture of berries and leaves of the myrtle plant (Mirtus Communis). Home-made mirto liqueur. Photo by Giancarlo Dessi. Two varieties of mirto exist: Mirto rosso (red), the most popular one, which is made with the berries and is sweet, and Mirto bianco (white), which is obtained from the leaves. As Mirto is always served very chilled, it is usually kept in the freezer for ideal serving temperature. Therefore, the bottling process is very important and the bottle is made of thick glass capable of withstanding very low temperatures. 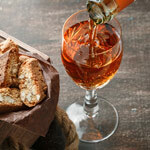 Nocino or Nocello is a dark-colored walnut- and hazelnut-flavored liqueur from Modena, Emilia-Romagna. Nocello is similar in taste to Frangelico, with a sweet, rounded and balanced walnut flavour with vanilla tones. Sambuca is an Italian anise-flavoured liqueur, produced from the infusion of witch elder bush and licorice, sweetened with sugar and enhanced with a combination of herbs and spices. White Sambuca is the traditional and generally more popular variety, with a mellower licorice taste and lighter colored body than that of black sambuca, which is deep blue in color or red sambuca which is bright red. 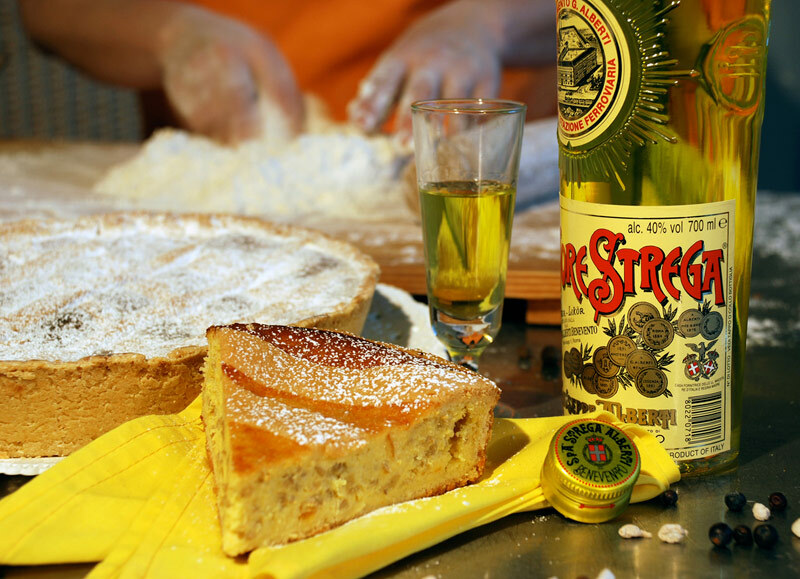 Strega is a yellow, sweet liqueur with a slight aftertaste of anice. It contains aromatic herbs, sugar and safran. Tuaca is an amber-colored, sweet liqueur, originally from Livorno, but since 2010 produced by the Tuaca Liqueur company of Louisville, Kentucky. It is made of brandy, flavored with orange essence and vanilla. The taste is bold, yet surprisingly smooth for a 35% alcohol content beverage. 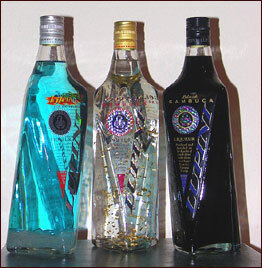 Tuaca is usually chilled and consumed neat, but it can also be mixed in cocktails. Italy’s sweet dessert wines were purposely left out of this list as they deserve a chapter of their own: Italian dessert wines. First published on www.yourguidetoitaly.com in June 2013; updated and redirected to Slow Italy. 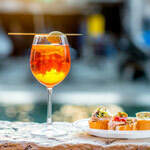 Italy’s aperitivo culture and Italian cocktail drinks. Photo credits: all photos © Slow Italy, except (from top to bottom), Centerbe by Dan Leone; Fernet poster by fixedgear; Maraschino by WillCookforFriends; Strega by Carmine Savarese.